The band - who scored their first UK number one for 43 years at the weekend - saw their new release 13 win the Best Album prize at the Metal Hammer Golden Gods awards bash. 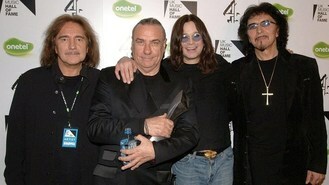 Sabbath, led by frontman Ozzy Osbourne, were also named Best Band at the event staged in London's IndigO2. Collecting the honorary Golden God Award were fellow rock veterans Motorhead, to recognise their contribution in shaping the world of rock. Actor Brian Blessed was honoured as an unlikely heavy rock hero as he was given the Spirit Of Hammer Award, which is to celebrate well-known figures who "encapsulate the passion and essence" of metal. Past winners have included Bill Bailey and Sir Christopher Lee. US band Alice In Chains were named Icons Of The Year and guitarist Scott Gorham of Thin Lizzy took the Riff Lord Award at the event supported by Orange Amplification. Alexander Milas, the editor of Metal Hammer, said of the event: "From honouring the lords of our world Black Sabbath and the crown princes of rock and roll Motorhead, as well as today's most cutting-edge acts, there's simply no other event like it. "In the spirit of tonight's Spirit Of Hammer winner Brian Blessed, the message of tonight's outrageously entertaining event is clear... metal's alive."